In sections of the Bronx, in the West Side section of St. Paul, Minnesota, and in the Boyle Heights area of Los Angeles, Spanish-speaking Latinos replaced Yiddish-speaking Jews as the newest immigrant group. The ILGWU began organizing Latinas in Los Angeles in the 1930s. Photo courtesy of Jaime Gonzalez Monroy, whose mother is pictured in the Labor Day parade. Organized labor often served as a bridge between these working-class, ethnic communities. Unions also provided a political voice for the emerging Latino community. 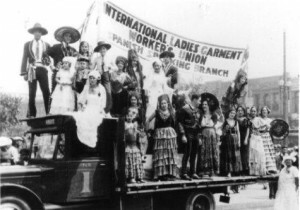 The International Ladies Garment Workers’ Union (ILGWU) served this function on the Eastside of Los Angeles. The ILGWU engaged directly in civic life. It also helped establish and worked through a variety of Latino and Jewish and organizations, as well as broad-based civil rights coalitions. The groups in the ILGWU’s sphere of influence included the Jewish Labor Committee and the Mexican American-oriented Community Service Organization (CSO). Early CSO leaders included Maria Duran and Hope Mendoza from the ILGWU. Directly and indirectly the ILGWU played a key role in the election of Edward Roybal to the Los Angeles City Council in 1949, and to the adoption of fair employment and fair housing laws in California in the late 1950s and early 1960s. “Garment Workers as Bridge Builders” was presented at Latinos and Jews: A Conference on Historical and Contemporary Connections. The conference was sponsored by the University of California, Irvine’s Center for Research on Latinos in a Global Society and the American Jewish Committee. Additional insights on the ILGWU and Latino-Jewish relations are to be found in my book, The Search for a Civic Voice: California Latino Politics, with a foreword by Antonio Villaraigosa. This entry was posted in California, Unions and tagged CSO, ILGWU. Bookmark the permalink.